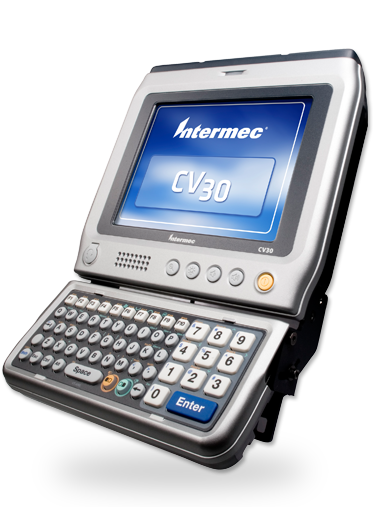 Our refurbished Intermec CV30 rugged fixed mount computer provides flexibility and high-performance capabilities in a compact design. The Intermec CV30 delivers real-time wireless supply chain management right where the data is— at the dock, in the freezer, on the warehouse floor, or in the yard. Incorporating our refurbished Intermec CV30 into your warehousing or manufacturing operation will enhance efficiency, increase safety and improve operator performance and productivity. Contact us today about buying, servicing, renting or selling Intermec CV30 gear! Our refurbished Intermec CV30 units are engineered to withstand the abuse of industrial environments and to satisfy user demands that vehicle mount computers be as durable as forklifts. Its cast magnesium housing, standard heated display and solid state design provides protection exceeding industrial and military standards. The Intermec CV30 thrives in harsh environments where dust, moisture or extreme temperatures are constants. Contact us today about buying, servicing, renting or selling Intermec CV30 gear!